Erica Cameron proves herself to be a master storyteller in this fantastic new series. 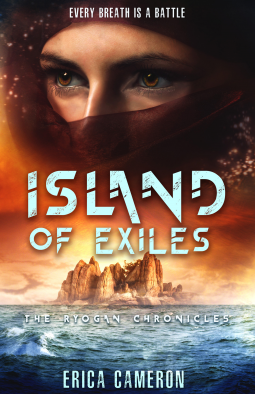 Island of Exiles is the first of The Ryogan Chronicles and it blew me away. From the detail of the world building to the courageous heroine, I found this story to be original and utterly fantastic! Khya is a powerful fykina with the ability to shield against magic. She wants nothing more than for her brother to become a warrior just like her. When he makes it through the herynshi, and is placed on a top ranking team, she believes they'll finally have more time together. Then Tessen, another Nyshin warrior, tells Khya that Yorri is gone and the very reason she breathes is lost. The story picks up here as Khya joins forces with a yonin who believes that Yorri is alive and being held for a secret purpose. She's pitted against the Miriseh, the clan leaders, and discovers their dark history. Understanding Shiara and the layered world that Cameron created is part of the experience. Her attention to detail and style is remarkable. She paints a vivid picture of a girl who would do anything to save her brother, yet still cares about the welfare of the people who rally around her. I appreciate the depth of this story, because sometimes authors write as though they associate YA with a level of comprehension. Island of Exiles is written with an open mind; anyone can enjoy it. Cameron took a story we've heard before and weaved it into a fantasy world with twists and turns. The story isn't too simple, or so complex that reading is a chore, but it's balanced. Island of Exiles was so much more than I was expecting and I can't wait until the next installment. It only gets better from here!